A new wave of plug-in hybrid black taxis have reached London's streets, as part of the city’s push to improve air quality. The all-new TX black cab promises “unrivalled comfort” for passengers with a smooth, limo-like ride and on-board charging for smartphones. An in-built multi-filter system will also remove toxic gases and particles from the incoming air and shut exterior vents when the cab is stuck in traffic. The TX will carry up to six adults and provide air conditioning and a panoramic sunroof, so tourists can enjoy all of London's sights. Fare payments will be contactless while a retractable integrated ramp should make it quicker and easier for wheelchair users to get in and out. The TX's hybrid powertrain will cover 400 miles on a single tank of fuel, including an all-electric range of 80 miles with zero emissions. 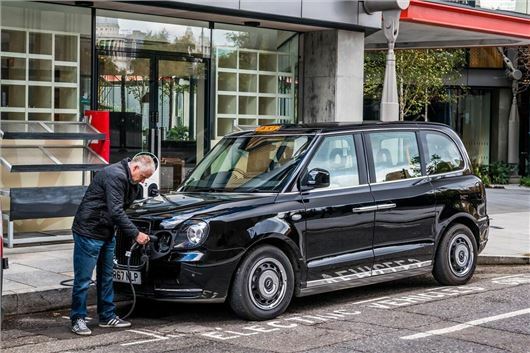 The taxi is powered by an electric motor and 1.5-litre petrol engine and can travel from London to Manchester and back again without needing to stop to refuel. The TX black cab is built by the London EV Company (LEVC) in Ansty, Coventry. The factory has created more than local 1000 jobs and has been funded by a £300 million investment from LEVC’s Chinese owners, Geely, who also own Volvo. The Government has also reportedly invested £16.1 million into the venture, which will see more than 20,000 electric taxis being built in Coventry every year. LEVC has also said it plans to build an all-electric van at the site too, although it hasn't said exactly when this will happen. From 1 January 2018, all taxis presented for licensing for the first time in London will need to be zero emission capable and emit no more than 50g/km CO2 with a minimum 30 mile zero emission range. A zero emission capable taxi must be petrol if an internal combustion engine is used. LEVC hopes to have around 150 of the new black cabs on the streets of London by the end of 2017 and over the next 24 months it claims that this number will grow to more than 9000. LEVC is also taking export orders and hopes to have versions of its hybrid taxi in every major European city.